Great weather for a hastily organised protest that I only found out about because I was on the ferry with some protestors. Architects, Landscape Architects, Devonport Heritage, Local Board Members (from Devonport/Takapuna and Waitemata) and at least a couple of Auckland Councillors (Chris Darby and Wayne Walker). 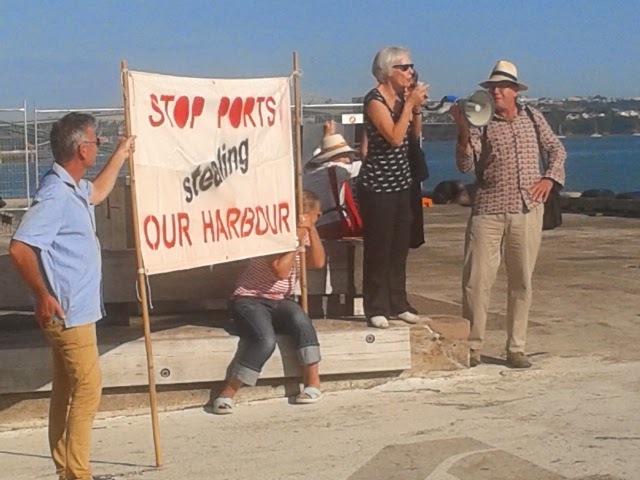 Margot McCrae speaks out, while noted architect Julian Mitchell holds the megaphone. Later, Cllr Darby addressed the crowd. Tip of the iceberg of public concern. Great to see this being organised by Auckland's urban design professionals. This pic shows what the fight is over. 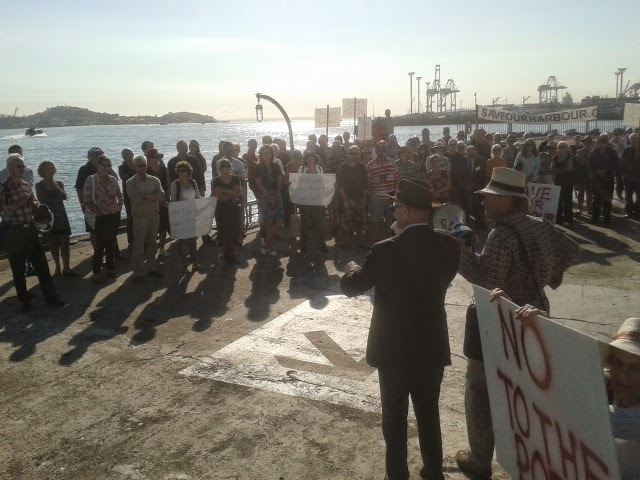 Behind the protestors you can see the entrance to Waitemata Harbour - framed to the right by the end of Bledisloe Wharf reclamation - and to the left by North Head at Devonport. 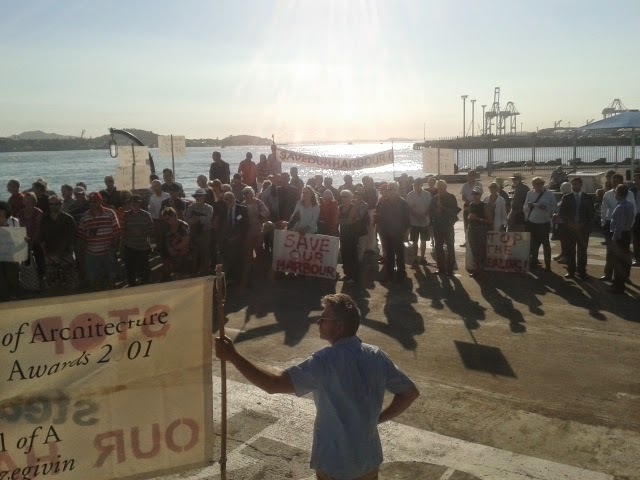 The draped banner shows the seaview that would be blocked by POAL's proposed B2 and B3 wharf expansions (each about 100 metres long and 30 metres wide), which POAL has indicated it would want to infill between in future. Any POAL talk that "you can see under the B2 and B3 wharf structures" is disingenuous to say the least. This was an excellent opportunity to gain some media attention before the Notice of Motion meeting tomorrow of the Auckland Development Committee of Auckland Council. This meeting will re-consider its recent "decision" to weaken its stance from "reclamation is non-complying" to "reclamation is discretionary". The Notice of Motion ahs been signed by 9 councillors after hard work by Cllr Chris Darby. The NOM meeting is timed for 1:30pm tomorrow - Thursday - at the usual meeting venue old Auckland Council Building on Queens Street. There is confusion about whether public will be allowed to address that meeting - there is talk that it might be held "in confidential". This is all legal dancing on the head of a pin stuff by Council officers. Sure the Unitary Plan needs to be sorted out, and property rights need to be protected and legal positions agreed behind closed doors. 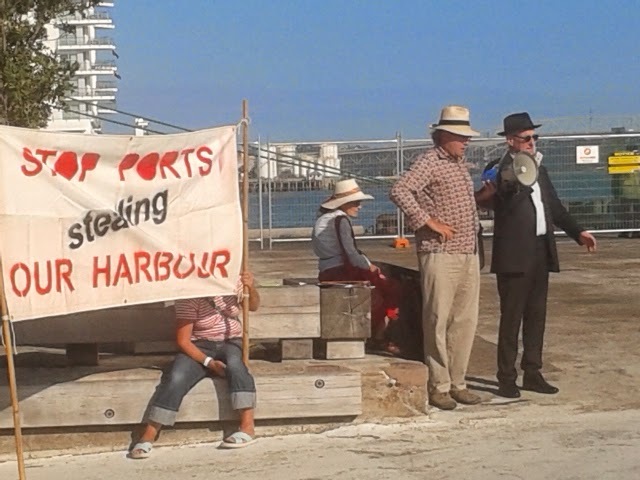 But this matter - the matter that POAL be permitted by its Auckland Council owner to act in its own interests and expand its reclaimed land holdings - that matter is a Local Government Act matter. Legitimate for you to consider that matter in public. And where is the second stage port study anyway? 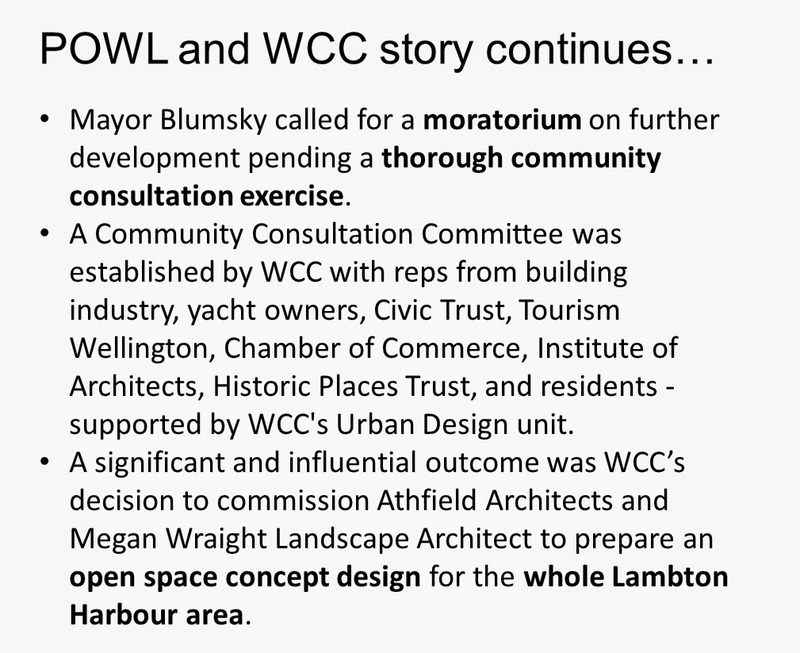 In my view Council should be taking public soundings right now, as Mayor Blumsky did when public lost confidence there in Wellington Council's handling of waterfront issues, and call for a moratorium on all waterfront development. Pending engagement with the public and Auckland's design community over the whole waterfront redevelopment from Custom Street, Downtown, Quay Street, Light Rail, Buses, Queens Wharf, Captain Cook, Marsden, and Ports. And a funded and staged Masterplan. Instead of the present ad hoc arrangements. Ask the people what they think. 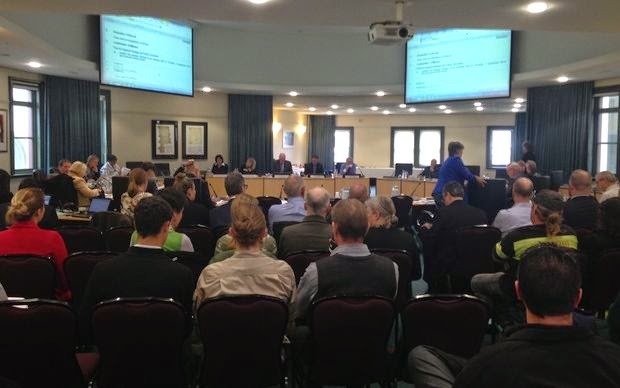 Auckland Council had a big meeting covering a number of issues of interest to me on Thursday, 12th February. These included Queen Elizabeth Square, Central Wharves Strategy, and Expansion of Ports. I asked for and obtained speaking rights and was granted the opportunity of a 5 minute slot. This has been captured on Council's excellent live news feed from the meeting - and you can see the actual presentation - and questions here on video demand. These are the slides I presented (with one exception). 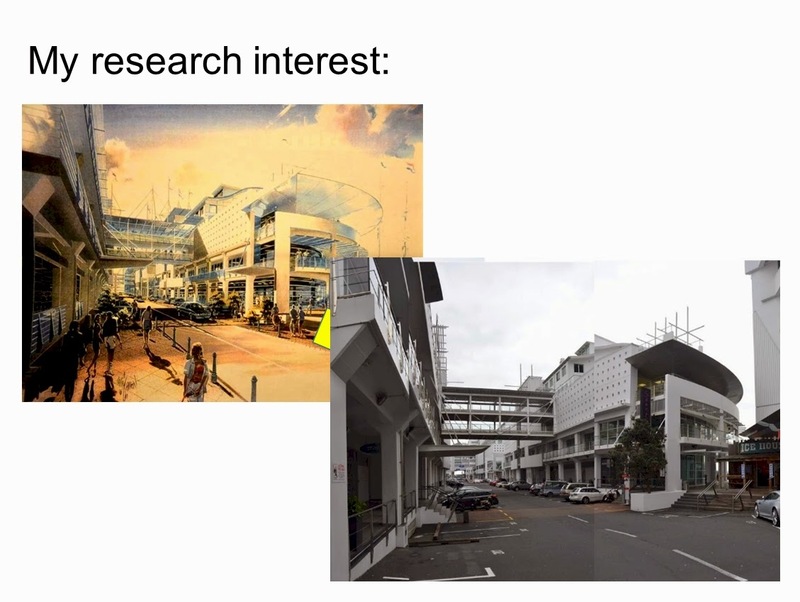 I introduced the presentation by explaining that the work was some of the fruit from PhD research I am enrolled to do at School of Architecture and Planning at University of Auckland. 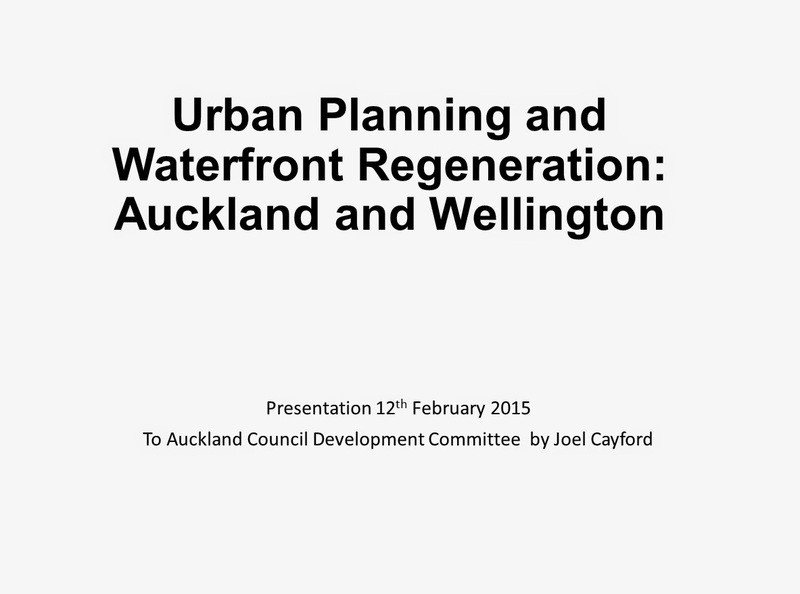 The PhD is a planning study which compares approaches to waterfront urban regeneration at Auckland and Wellington. 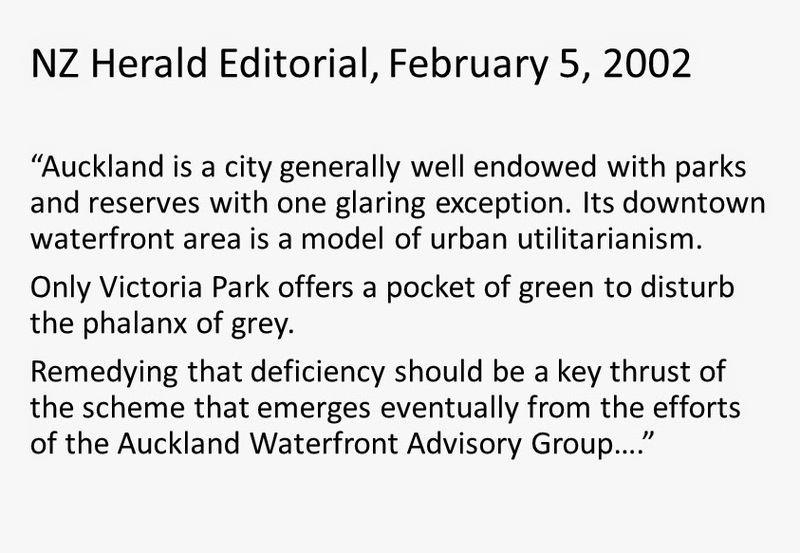 Because my major objective in much of the work I am dedicated to in Auckland relates to the provision of effective public space and amenity, I began with this quote from a NZ Herald Editorial thirteen years ago. It argues for more green public space in Auckland's downtown waterfront area. There has been a wonderful little addition since that time - and that is Takutai Square in Britomart Precinct. This diagram shows some of the transactions that have occurred as AHB and POAL have changed the uses of various parts of the land that AHB has reclaimed over the years. AHB and POAL have pocketed large capital sums, and continue to extract significant rental revenues from reclaimed land assets. I have sought information about the proportion of POAL revenues that derive from its real estate business. But this information has been denied, because, apparently, it is not provided to its owner. Over the years AHB reclaimed 162 hectares of the seabed in proximity to the central city - this is shown here as land to the north of the red line which in part is the site of Custom Street. Over the years much of this land - which was vested in AHB - has changed in use as summarised in the slide. In round numbers POAL now occupies about a third of what was reclaimed, streets and public amenities and publicly owned buildings (like the CPO) occupy another third, and the remaining third has been sold for private development. The situation in Wellington is significantly different. You can read here a tiny part of my research findings. 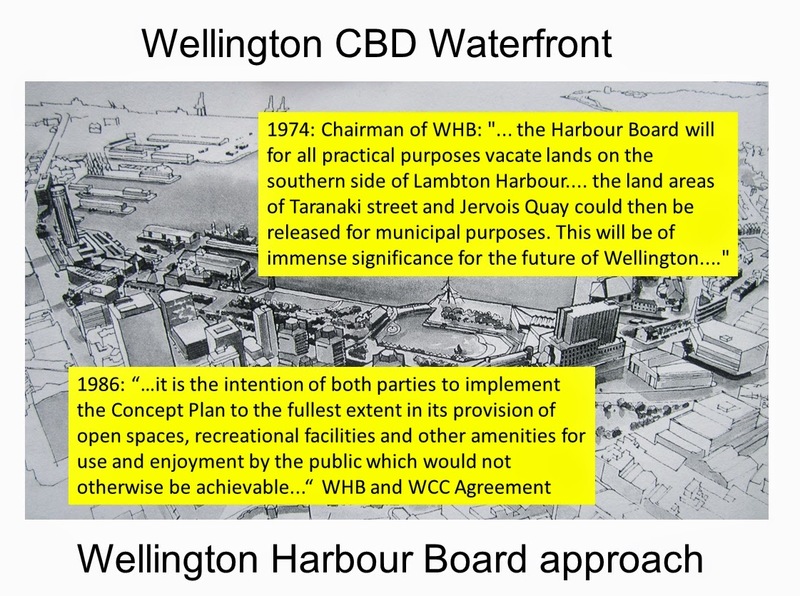 The quote from the Chairman of Wellington Harbour Board was the start of a process where the whole of Lambton Harbour and reclamations back to Jervois Quay was shifted from port use to civic use and development. Unlike the ad hoc approach that has been deployed by AHB and POAL. 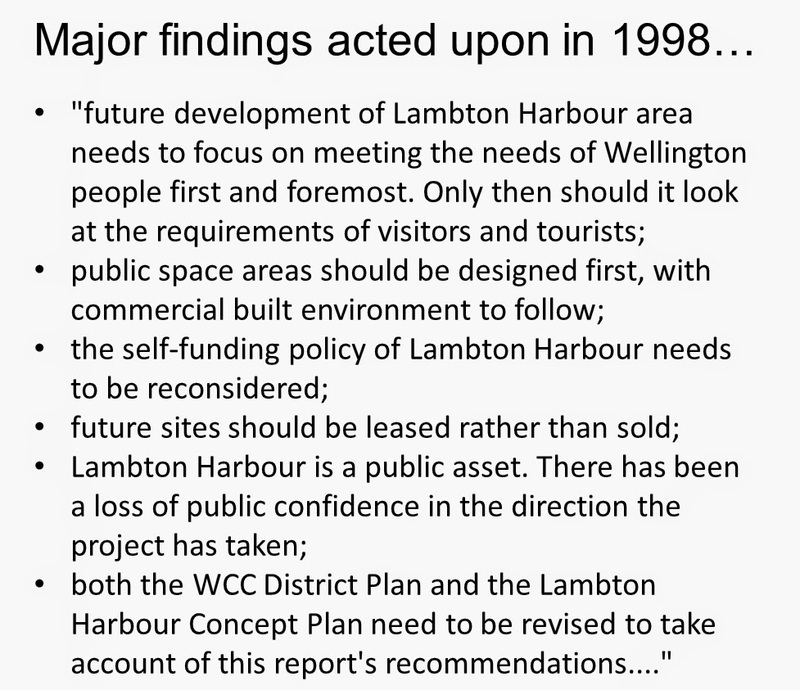 The 1986 quote is an extract from a legally binding agreement entered into between WHB and Wellington City Council which clearly commits both parties to working together to deliver open spaces, recreational facilities and suchlike for enjoyment by the public which would not otherwise be achievable. My research interest was triggered in Auckland by Princes Wharf. I still find it extraordinary that Auckland authorities have not had the gumption to conduct a thorough enquiry into the Princes Wharf fiasco. The public is faced with a wall of silence. Reflection is an important part of good planning. Wisdom comes from checking what went according to plan and what didn't. Reputations all over the city would not be ruined with a useful dose of truth-seeking, but would help us all learn and not repeat the same planning mistakes. Which I see too clearly happening again now downtown. The artist's picture shows a Prince Wharf concept with huge amounts of public amenity that was published and attracted public support. The other photo shows what is there today. 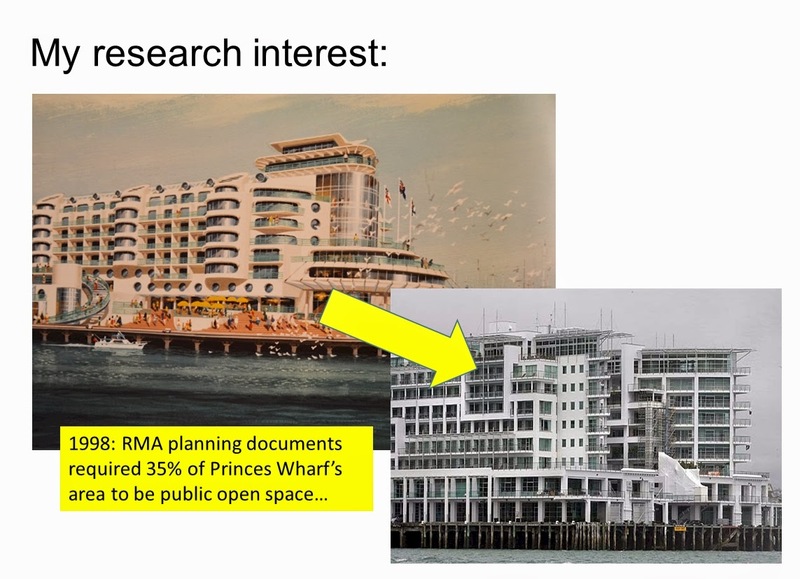 And it should be noted that the RMA plans called for 35% of Princes Wharf to be public space. The same sorts of quantitative promises are being made right now by Auckland Council over what will replace Queen Elizabeth Square. It's not about quantity guys, it's about quality. We have 35% public space all right - but how good it is? For example these two images show what was promised for the public space within the Princes Wharf development - and what you see now if you are ever attracted to go down there. Talk about a phalanx of grey, and where public space is 100% "shared" with cars. We need to learn from the past behaviours of AHB and POAL. But this learning should not be taken up by Auckland Council as its own raison d'etre. Which is what seems to be happening. 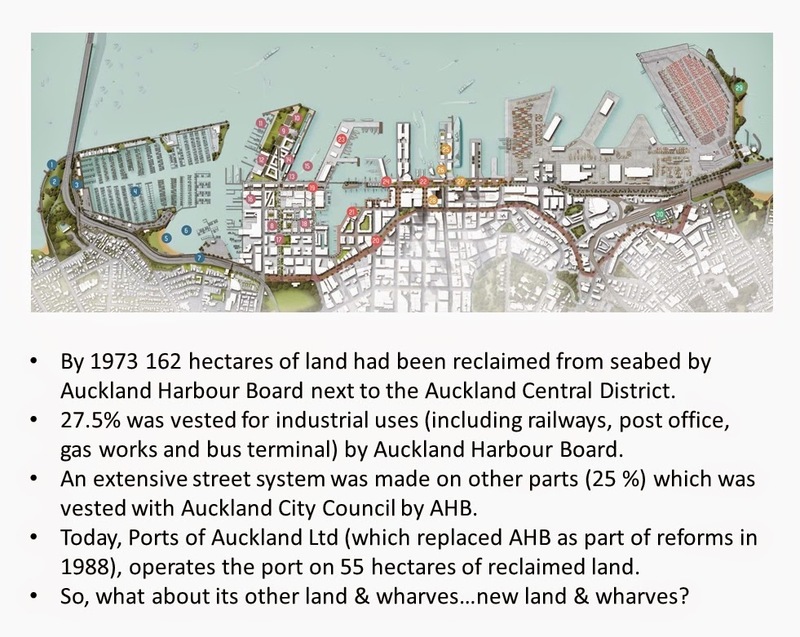 This interesting observation (in the slide) from the previous Chairman of Wellington Harbour Board explains the bind we have been in, here in Auckland. It explains the motivations behind POAL and AHB behaviours. It explains their rationale. We need to understand it for what it is, and work around it and against it in the broader public interest. 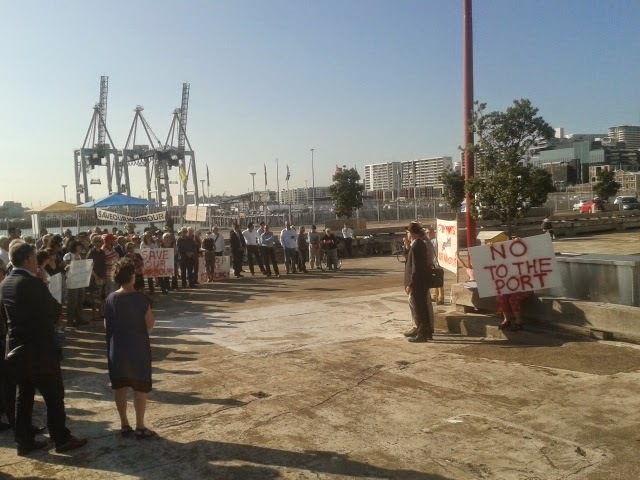 This is not to say that Auckland's port should move somewhere else, but it is to say that it needs to be contained and controlled. Because they won't control themselves. They are not incentivised to curb their expansionist behaviours or to use their land efficiently for port purposes only. They are motivated to act like a seaside property speculator. Council has the duty, powers and responsibility to control POAL. The Wellington story is not a fairytale. It is littered with problems, issues and famous public confrontations. My research has brought to light stories that raged in local newspapers and on the ground. One was the ham-fisted effort to build a Retail and Events Centre on its Queens Wharf. 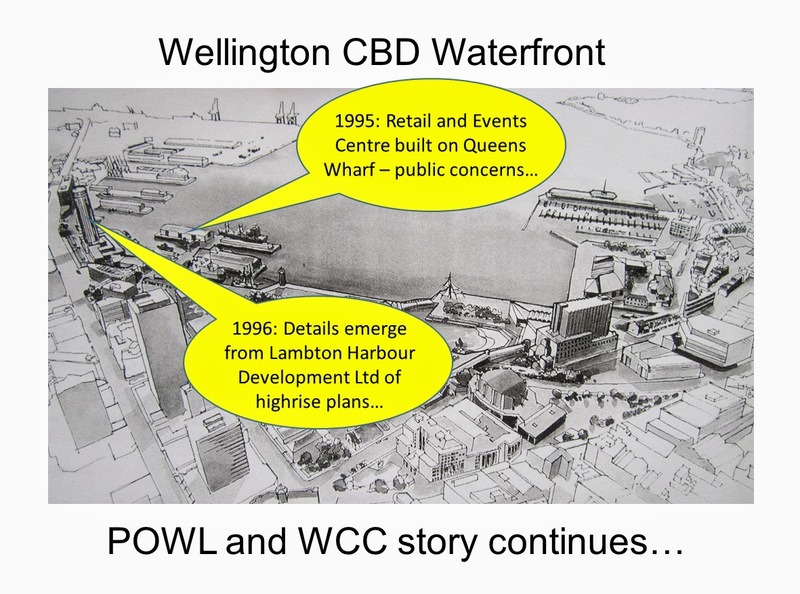 Another related to plans pushed by Wellington's Waterfront Development Agency for a waterfront tower. These and other issues culminated in a public meeting attended by a 1,000. Wellington City Council recognised it had an issue, and took action which was strongly and effectively led by Mayor Blumsky. This slide lists major findings of the community consultation committee. It is important to note that this committee was made up of members of the great and the good. It was not a rabble of grumpy yachties for example. It was supported by Wellington City Council's urban design unit and staff. The reports that were produced, the way the Council acted and supported the committee, the reports it received, and the decisions it then took are exemplary and show a much sounder based way forward for Auckland Council than its present ad hoc and pragmatic approach. 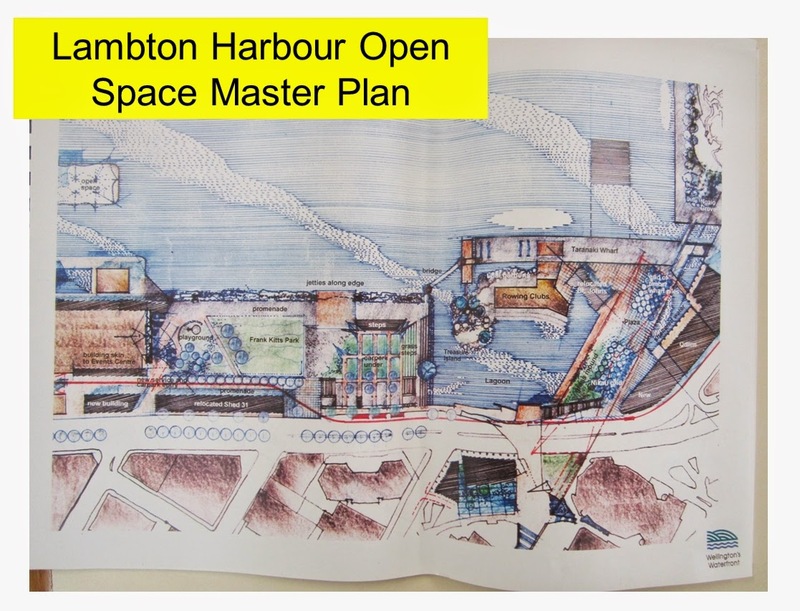 One of the most significant outputs and outcomes of the community process was the production of the Lambton Harbour Open Space Master Plan. This was prepared with the Consultation Committee, Wellington City Council - and by a grouping of New Zealand's leading architects and landscape architects (Athfields, Megan Wraight and others). The image here is one part of it. Those who have been to Wellington will recognise that much of what you see there today, was envisaged in this plan - which significantly provides for at least 5 separate green spaces. Any building or commercial development is shown in outline, and how they might relate to the public spaces. But it is the public space design which sets the context for built development. Not the other way round as we see at present in Auckland CBD waterfront planning, where public space has become the poor cousin in urban planning and urban design. 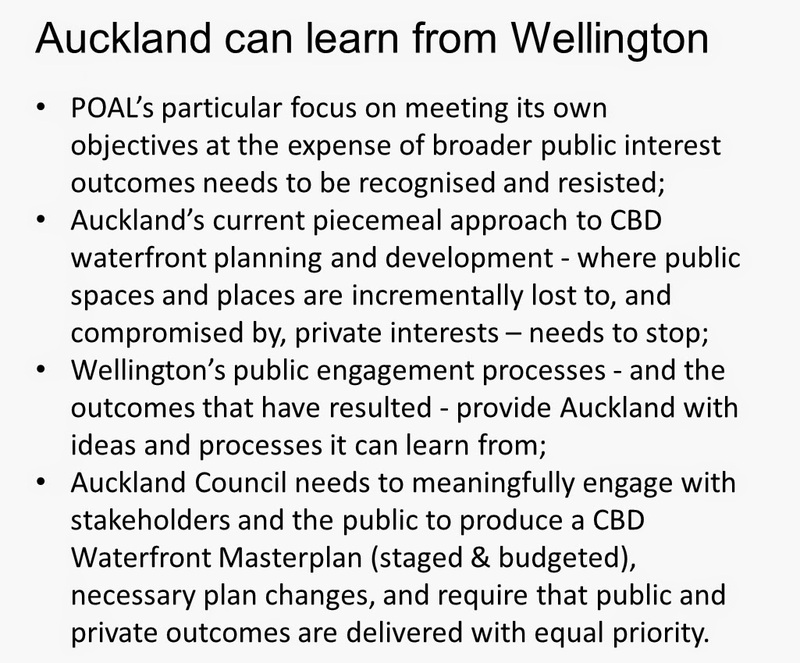 My final slide summarised to the Auckland Development Committee what I think it can learn from its own history and from the more civic minded approach that has delivered to Wellington the waterfront that it now enjoys. There was a lot going on at the Auckland Development Committee meeting on Thursday 12th Feb. (By the way - this pic wasn't taken at the time - - just here for illustrative purposes). 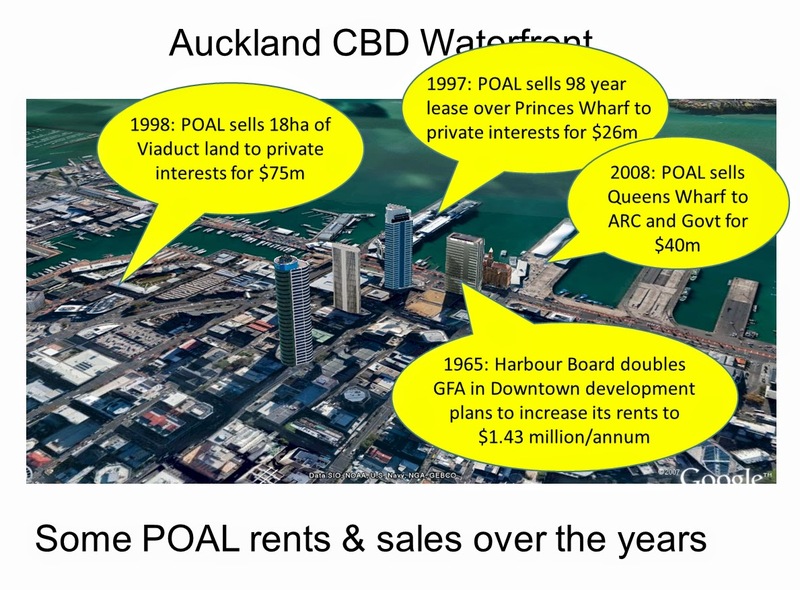 This blog contains my big picture view of where Council is going with: Downtown development; Queens Wharf; Central wharves strategy; and Ports Expansion. These matters were all dealt with at this meeting - but in separate, seemingly ad hoc items. The blog also contains my more detailed observations of three interesting moments (out of many). 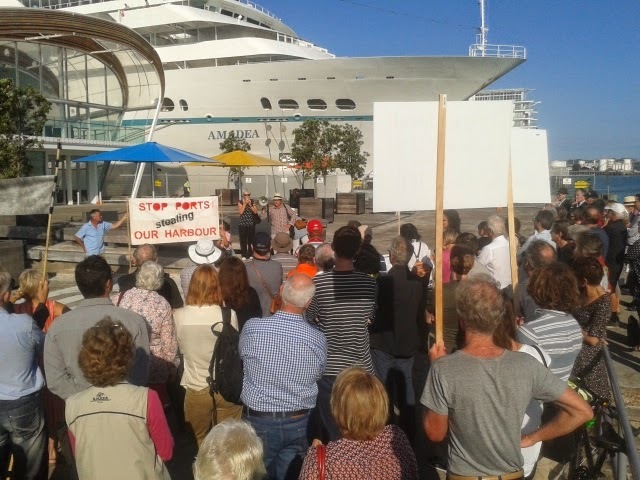 First of all, I generally think it's a good idea to make a double cruise ship terminal on Captain Cook Wharf lengthened by about 100 metres, in order to free up Queens Wharf so it can genuinely become a people's wharf, and to better provide for cruise ships in Auckland. However, until this is funded, and until a discussion is had about why POAL shouldn't run that facility (after all POAL pockets berthage fees, and doesn't POWL run Wellington's cruise ship terminal?). 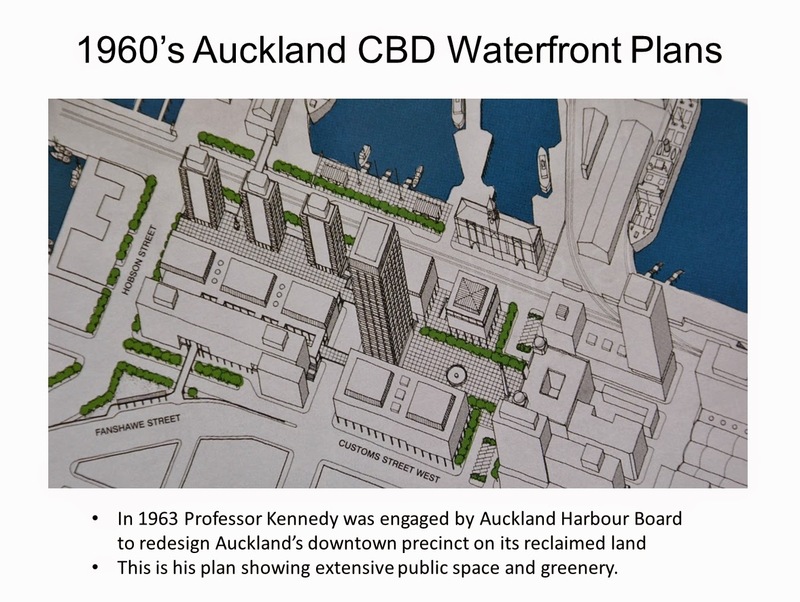 I am also persuaded by landscape architects of the significance of the Queen Street through and onto to Queens Wharf alignment as a design driver for downtown development. However that should not be at the expense of public space options which are threatened, for example, with the loss of Queen Elizabeth Square, and nor should we be blind to the loss of public open space in Lower Queen Street that is envisaged with buses circulating around Endean Building and Mercure Building and hence onto Lower Queen Street and with a fast frequent light rail service that is now being considered. However, given Auckland's history of promising all sorts of public benefits to smooth the way for private developments, I am increasingly concerned that history may be repeating itself right now. Call me cynical maybe, but I could not help but see Thursday's meeting as being primarily about getting the Precinct Development and CRL enabling works underway. A significant log-jam in that project is Queen Elizabeth Square and Auckland Council's need to compensate Precinct properties for the loss of carparks in its high rise project that will be caused by the Central Rail Link (CRL) Tunnel passing directly beneath. The price oif compensation has never been revealed but it appears to be around $25,000,000 to $30,000,000. The freehold sale price of QE Square has also not been revealed - understandeable as a commercial transaction - but it has been estimated at around $60,000,000. A problem for Council is its variously stated commitments and obligations to provide commensurate public space nearby (though what "nearby" means is a challenge). Council would like to effectively trade QE Square away and get the CRL tunnel works underway, but it must also provide "commensurate" public space. Solving that conundrum is Council's priority. There were some memorable Q&A sessions which really should be edited from the live webcast and presented as stand-alone clips. Cllr Wayne Walker was insistent and competent in asking Rick Walden of Centre Centre Integration (CCI) and Clive Fuhr of Auckland Council Property Ltd (ACPL) respectively about how Lower Queen Street would work as a public space without QE Square and with planned bus and light rail movements, and about whether Council would retain more control over how QE Square developed if it sold a leasehold interest and not a freehold interest. 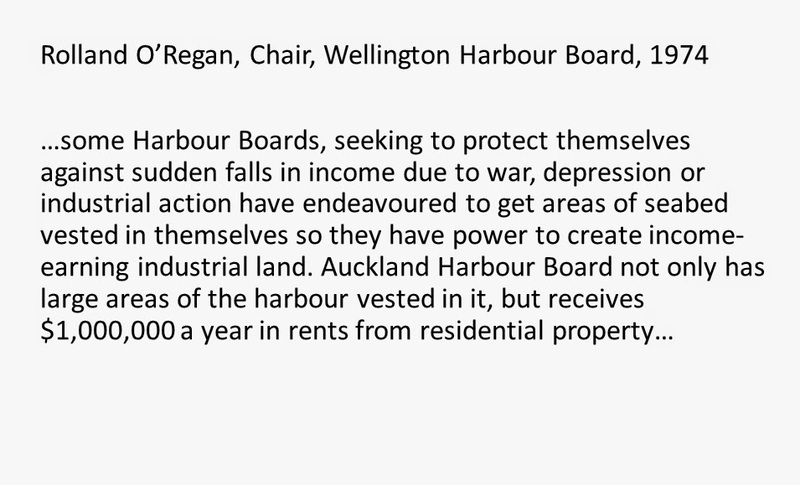 This latter question was a fascinating insight because it is widely known around the table that Waterfront Auckland has been able to achieve all sorts of environmental and social benefits from developers by virtue of leasehold arrangements. Cllr Walker persisted with Clive Fuhr, getting fobbed off and deflected, and finally asked Clive the perfect question: "Would Council have more control over what happened on QE Square land if it was a leasehold sale?" Clive would have known the answer. Instead he turned his head and said ,"I think Mr Watts an provide the asnwer to that." He was referring to Tim Watts who is an urban planner and urgan designer for Auckland Council. He is not a part of Council's Property CCO. The fact that Cllr Walker had to persist with this line of questioning, and the fact that those who know the facts will not state them in a meeting makes the meeting a farce. 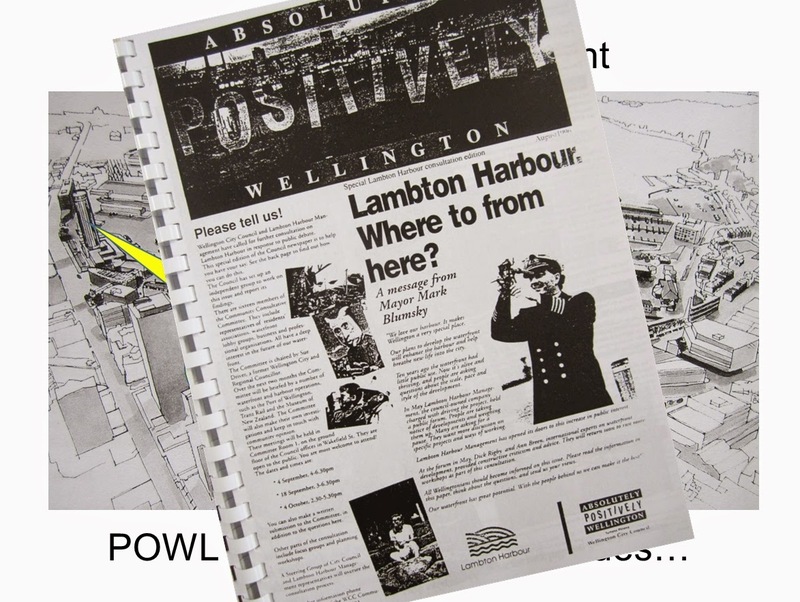 The second memorable moment came when Cllr Chris Darby was handed a POAL Q&A paper which contained information about POAL's freshly and non-notified consents for B2 and B3 extensions to Bledisloe Wharf. He wanted to know how much Rick Walden knew about the POAL plans when Rick had responsibility for preparing the plans and options consideration for the Captain Cook cruise ship terminal extensions. Cllr Darby was first able to establish that what POAL was proposing would affect the ability of Captain Cook to handle crusie ships. Rick Walden was clearly uncomfortable about the questioning, but, like Clive tried to bat the questions away, rather than honestly answer them. Very bad public look. Finally Cllr Darby asked the hard question, "When did you know about POAL's consented plans to lengthen Beldisloe Wharf?" (Doesn't this sound like the sort of thing you might expect in court? How the hell has it got to this? Why are councillors being denied relevant information? How can they make good decisions when relevant history, facts etc are being kep from the?) At least Rick Walden answered this one. He said, if my memory serves me right, "I heard on Sunday night." Which was about 4 days before the meeting. This raises another question. How can the manager if city centre integration do his job if he's being kept in the dark about what other parts of the council "family" are doing and deciding? (Cllr Fletcher generously observed that "there was a glitch in the system" and went on to more honestly describe it as a "toxic environment"). The third memorable moment came from Cllr Brewer. He had sat stewing for hours in the earlier parts of the meeting. Saying little but becoming increasingly uncomfortable. Late in the day he made a number of observations which are important. One of these was to the effect that: "we talk about having a waterfront masterplan but we don't really. 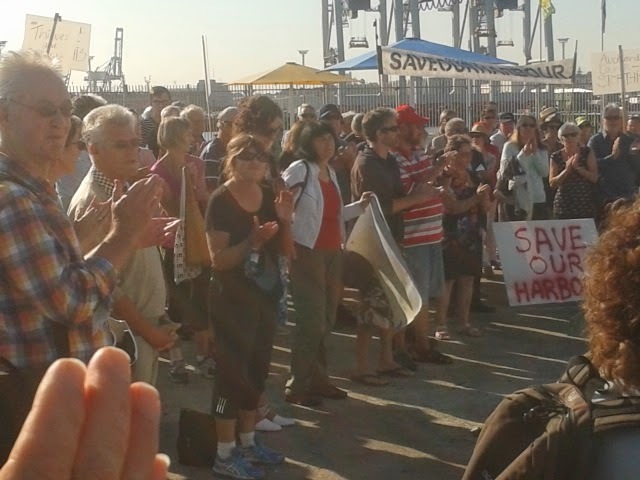 Instead we have a number of separate plans, and even when we did the waterfront masterplan the port was left out. 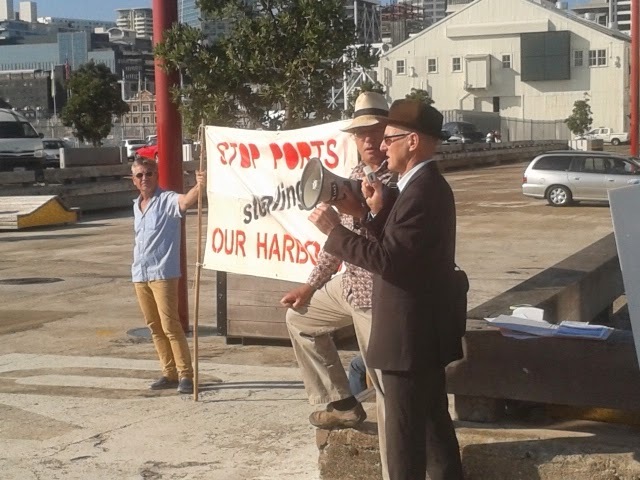 That's clearly a problem..." and he also spoke about the port company itself, "....with all the money the port has been paid for land why isn't it paying for the lengthening of Captain Cook Wharf...?" His frustration was telling. Good planning is about good argument nothing hidden. Bad planning resorts to pragmatism and power. That's what we are seeing here. Unless Council fixes itself, there will be a steady decline in public confidence, and necessary resort to the courts for resolution because recent Council decisions are not in compliance with either the Resource Management Act or the Local Government Act.